As fall arrives full force and harvest festivals abound, I can’t help but think about the unforgettable scene near the end of Harper Lee’s classic novel “To Kill a Mockingbird.” It’s Halloween night and Jem Finch is walking little sister Scout, who’s dressed as a ham, home from a pageant celebrating their county’s agricultural products. He’s holding onto her hock as they make their way through the darkness, certain they hear footsteps behind them. If you don’t know what happens next, you should read the book. So should a lot of folks, including the eighth graders in Biloxi, Mississippi who—just a few weeks ago–had the novel removed from their curriculum because it made some people “uncomfortable.” Following a great deal of uproar, “Mockingbird” was returned to the reading list. Sort of. English teachers are now offering interested students the option of participating in in-depth study as long as their parents sign a permission slip. Good grief. I wish I could share my little story with those in Biloxi and elsewhere who advocated pulling “Mockingbird” from the classroom. All three of my children read it in ninth grade English class, just as I had done thirty-something years earlier. To this day, I’m convinced that “Mockingbird” changed the way I look at the world more than any book I’ve ever read. Daughters Meg and Leigh agreed it did the same for them, so they were excited when it came time for younger brother James to study it in school. The girls and I gasped in unison. 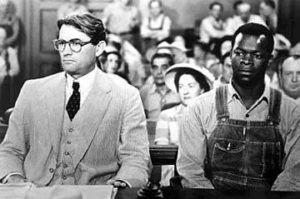 I resisted the urge to put my hands on my hips and raise my eyebrows and ask how anyone could hate “To Kill a Mockingbird.” Instead, I asked James why. “Because they killed Tom Robinson,” he said. Precisely. Racial injustice is not only supposed to make people “uncomfortable,” it’s supposed to make them outraged. Which is one reason “Mockingbird” won the Pulitzer Prize, has sold 40 million copies worldwide and has been taught in junior high and high school classrooms since its publication in 1960. And why it’s every bit as relevant and important today as it was fifty years ago. Maybe more so.